Anyone who experiences the discomfort of dry skin learns the importance of skin care. What many don’t know is that you don’t need a store-bought lotion to keep your skin moisturized. In fact, since ancient times all over the world, vegetable oils and natural aromatics have been the primary saviors for dry skin. Some people fear that applying a vegetable oil to the skin might make it sticky. It all depends on what oil you use. 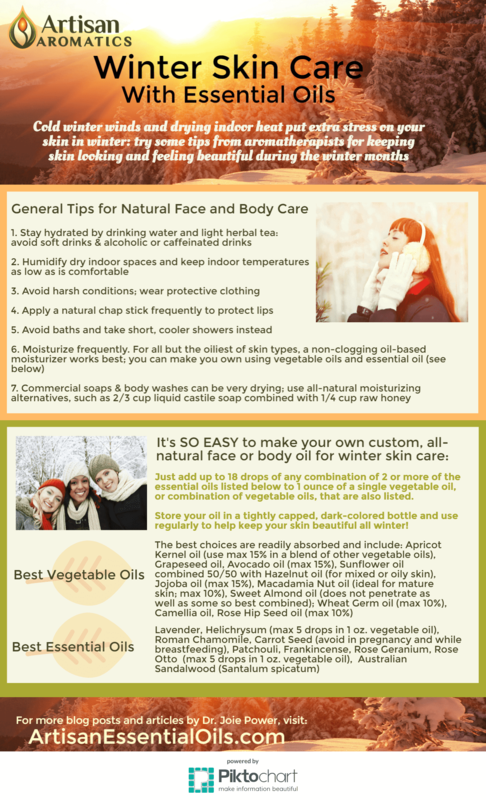 This infographic includes a list of vegetable oils that make great bases for natural skin care because they are usually readily absorbed by most skin types when blended in suggested concentrations. Great base oils include: Peach Kernel, Grapeseed, Avocado, Sunflower combined with Hazelnut, Jojoba, Macadamia Nut, Sweet Almond, Wheat Germ, Camellia and Rose Hip Seed Oils. See the bottom box of the infographic for details and dilution ratios for each of these oils. Many essential oils have been reported by aromatherapists to have properties that nourish, moisturize and seal dry skin. These include: Lavender, Helichrysum (max 5 drops in 1 oz. vegetable oil), Roman Chamomile, Carrot Seed (avoid in pregnancy and while breastfeeding), Patchouli, Frankincense, Rose Geranium, Rose Otto (max 5 drops in 1 oz. vegetable oil), and Australian Sandalwood (Santalum spicatum). When making your custom blend, be sure to follow proper dilution ratios: 18 drops of a combination of 2 or more essential oils to one ounce of vegetable oil, or combination of vegetable oils. It’s really important to dilute essential oils properly when applying them to skin. Do you want to restore and seal moisture into the skin, so that the nasty feeling of craving lotion eventually disappears? We believe that a custom facial care blend can help you achieve this goal without resorting to costly, synthetic cosmetics. Gently massage your custom oil blend into your face (avoid the eye area), especially after washing, to help seal in the moisture. Tip: Your custom blend can also be used on other parts of the body suffering from winter dryness. Just be sure to avoid delicate tissues, membranes, wounds and areas of damaged skin. What is your favorite essential oil and carrier oil combination? Let me know in the Comments! I love lavender lemongrass orange peppermint tree tea oil and eucalyptus .